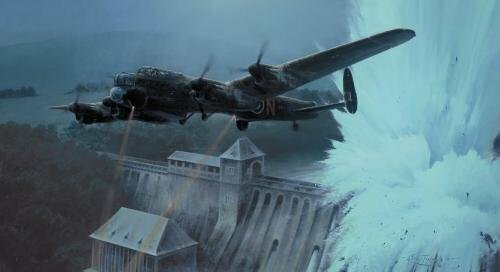 Pilots Shannon and Maudsley tried time and again to position their laden bombers correctly before managing to release their weapons – but the dam still held. Now success depended solely on Knight carrying the last bomb! With time and fuel now a concern, Knight’s first effort to position, like Shannon and Maudsley before him, failed, but his second run favoured the brave. Knight released his bomb with absolute precision, striking the wall at precisely the crucial point. With a tremendous explosion the Eder Dam collapsed before their eyes. Robert Taylor’s sensational new painting vividly shows the dramatic moment of impact. In the cockpit Knight and flight engineer Ray Grayston fight the controls to clear the dam, combining their physical strength to haul the lumbering Lancaster up and over the dam and to clear the high ground that lies ahead. Below and behind them, the second of Germany’s mighty western dams lies finally breached. two veterans of the epic Dambusters Raid.